National Pet Month running from 1 April – 6 May celebrates its 30th anniversary this year and is focussing on the value of pets to our mental health. During the month we will be celebrating the joy of pet ownership, as well as talking about the importance of caring for a pet responsibly. Some of us will even be organising or attending fun and educational events about pet care, sharing our Top 10 Tips and raising cash for a favourite UK pet charity. Sponsored walks, sky dives, afternoon tea parties and bake sales, open days, quizzes, lessons in the classroom, pet visits to residential care homes, even bingo-athons and church services have all taken place over the past 30 years. 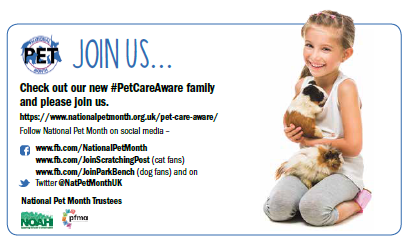 Everyone, from vets to charity volunteers, of all ages and backgrounds, is welcome to join in this year’s fun: become a supporter, tell National Pet Month what you are up to and have a look at what’s on in your area, on the Get Involved section of our website https://www.nationalpetmonth.org.uk/get-involved. With National Pet Month itself about to kick off, here are some key facts about how pets support our mental health. Pet owners make fewer visits to the doctors – pet owners are healthier, for example in Germany pet owners have been calculated as making 15% fewer visits to doctors – a saving of e5.9 billion pa. Pensioners that own a dog visit their doctors 21% less than non-dog owners. Pets help reduce blood pressure, heart rate and stress – just stroking pets or watching fish swim in an aquarium leads to reduced blood pressure and lower anxiety. The presence of a pet can reduce the heart rate even in stressful situations. Pets increase social engagement and cohesion – dogs in social settings encourage more social interactions. Other workers have found an effect with rabbits or turtles. Pets may also reduce feelings of loneliness and isolation. As we get older – pets in care homes can ameliorate loneliness. Aquariums have been found to improve behaviour and staff satisfaction in dementia units. An aquarium in the dining room has been shown to make people more interested and inclined to eat, thus improving appetite among residents. It is not just older people that can feel lonely, as shown by the fact we need a Campaign against Loneliness. With our increasingly single-person households, pets can offer support, where keeping them is practical. This can mean particularly people who are, for example, housebound, geographically isolated, or have challenges such as mental health problems or learning disabilities that make contact with people hard. Pets can be a lifeline for people living on the streets (with amazing support from organisations such as StreetVet and others who help keep these animals healthy). They give purpose and can help ease the early stages of alcohol or drug rehabilitation becoming a solid support for those who have entered recovery, animals have a lot to offer those struggling from addiction. Children with ADHD can benefit from working with and keeping a pet. Responsibility for a pet’s good health, and the routine of caring for it properly, together with the ‘feel good’ of playing (as pets need to play) and letting off steam in a constructive way helps them relax at night. Pets are completely non-judgemental – they are great listeners and do not criticise. This can help reluctant readers (with some schools welcoming ‘reading dogs’) and help with self confidence. Some charities, such as Dogs for Good, have highlighted how animals can help children with autism. From sensory support to road safety, through to just playing and being a best friend, benefits come from both specially trained assistance dogs and support for existing family pets. The Mental Health Foundation carried out a study with Cats Protection in 2011 which involved over 600 cat- and non-cat-owning respondents, with half of them describing themselves as currently having a mental health problem. The survey found that 87% of people who owned a cat felt it had a positive impact on their wellbeing, while 76% said they could cope with everyday life much better thanks to the company of their feline friends. Half of the cat owners felt that their cat’s presence and companionship was most helpful, followed by a third of respondents who described stroking a cat as a calming and helpful activity. With National Pet Month acting as a special time to put the spotlight on the value of our pets, what happens after May? Surely #NationalPetMonth’s (NPM) work is done for another year? Wrong. Time to bust some myths about NPM and explain why we need your support throughout the year, not just in April. We DO need you and no it won’t. The reason we ask you to register as a supporter is simple. The more UK pet fans we have registered with us, the more we can spread the word about the cause closest to our hearts – responsible pet ownership. National Pet Month is an educational charity and an umbrella charity. We spend a lot of our time working with other UK pet charities to ensure the responsible pet ownership message spreads far and wide. Although a charity in our own right, one of the main focuses of our campaign each year is not to raise money for us but to help OTHER UK pet charities fundraise for their incredible work. Just think of us as a pet friendly umbrella under which fellow pet workers can gather alongside the UK’s amazing pet owners. When you become a National Pet Month supporter one of the many great benefits is that you can use our reach to help your favourite UK pet charity. A winning combination! It’s always lovely if you want to donate to our charity, but that’s not the key aim with registration. When you sign up you join our database, allowing us, with your permission, to share with you all kinds of information about our work, the work of our trustees and other important announcements about pet welfare and you can, of course, unsubscribe at any time. Think of it like this. Would you be happy if your organisation’s logo was placed on a tweet, a Facebook post, a company’s marketing message, to promote their products and services without any prior knowledge or acknowledgement? Or your own photo shared far and wide? So, please spare us a thought and ask first. Even better, think about how you could be part of our success story when it comes to the welfare of our pets. Just imagine how much more we could do to spread the responsible pet care message if all those businesses using our logo committed to becoming a sponsor or supporter.